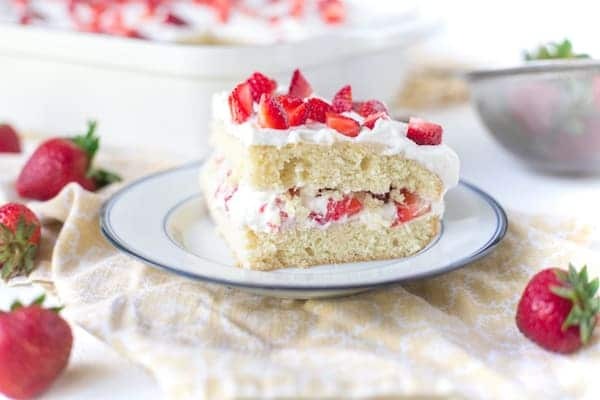 Strawberry Shortcake Cake is everything that is delicious about strawberry shortcake, but in one easy to serve cake! 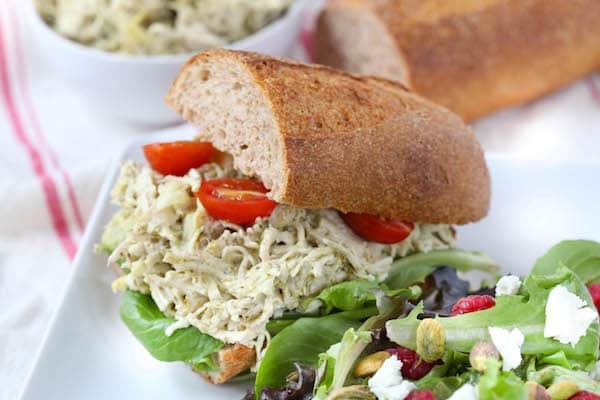 It is perfect for large groups and would be a perfect addition to a summer BBQ. Every year for Lars’ birthday (okay, so for the last 2 years) we get donuts for breakfast and then head out of town to go strawberry picking. His end-of-June birthday usually falls right in the middle of strawberry season, which works out great. This year, however, the weather did not cooperate. It was in the 90’s with a real feel of 100+ degrees. Not exactly the ideal weather to be in an open field picking strawberries. Especially not with a toddler and a baby. So, we kept the tradition of getting donuts because there’s no right or wrong weather for donuts, and we opted for plan B which was going to the beach. Okay, actually it was to go to a splash pad but when we got there, there was a wait to get in because it had maxed its occupancy. Yeah, it was freaking hot and everyone wanted to be in water. SO we opted for the beach which really ended up being the best idea. We stayed cool in the water, Lars jumped in the water from a dock for the first time, and we had a great time as a family. However, I really missed my big strawberry haul. Usually when we get home from our strawberry picking I keep some out for snacking and baking a few treats and then I freeze the rest for smoothies for a few months. Luckily the strawberries at the grocery stores have been great (and on sale! ), so I was able to stock up for some strawberry treats. First up, I made a Strawberry Shortcake Cake. 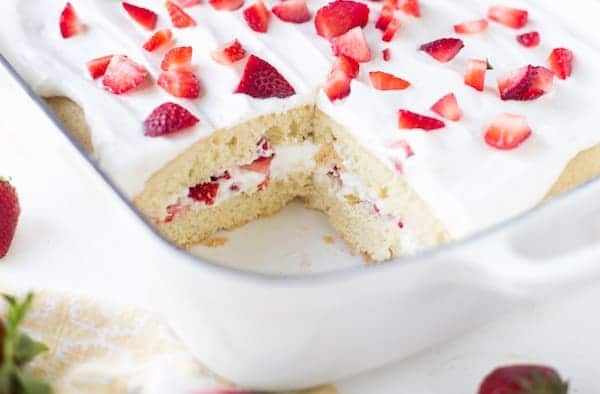 This Strawberry Shortcake Cake is my solution to making strawberry shortcake for a crowd. The cake is a pretty dense to resemble a shortcake. 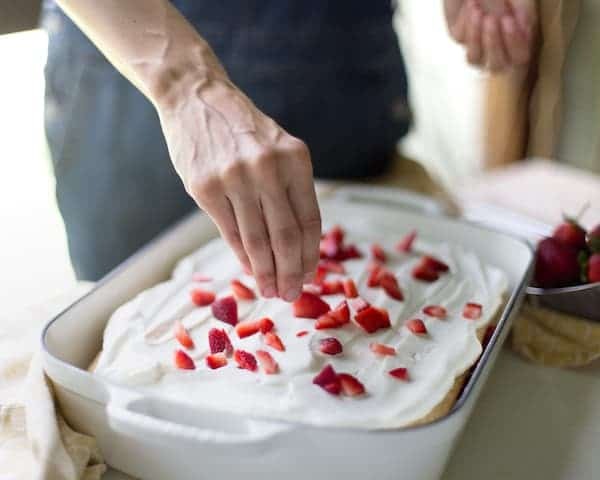 Then I sliced it in half so I could sandwich whipped cream and strawberries between the two layers, again resembling a shortcake. 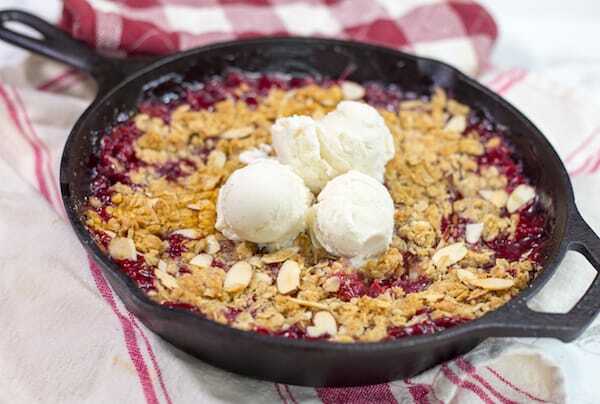 The great thing about this cake is that it can be assembled ahead of time (which is actually preferred) and served to a crowd, as opposed to individually assembling the shortcakes. 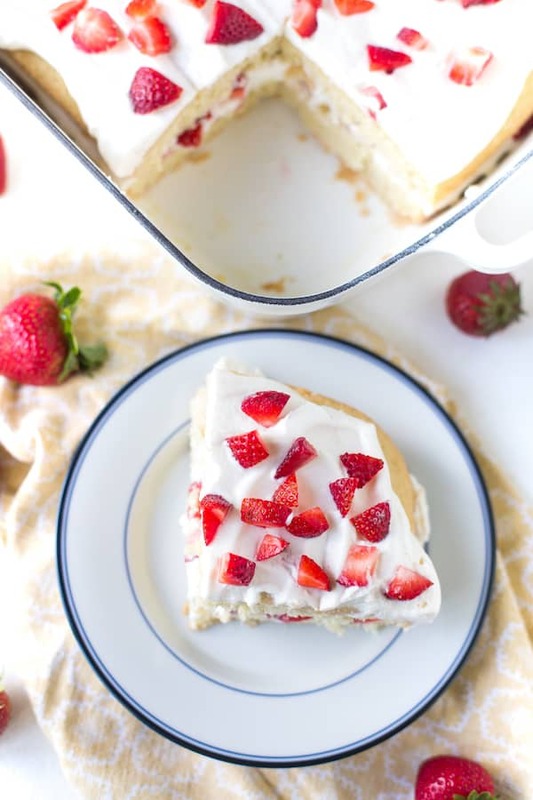 This light Strawberry Shortcake Cake would be great for any summer potluck or BBQ! Grease a 9x13” baking dish well with cooking spray and dust with flour. In a large bowl with an electric mixer, beat together the shortening and sugar until light and fluffy, about 2 minutes. Add vanilla extract, beating until combined. In a separate bowl, whisk together flour and baking powder, and whisk until combined. Add ½ of the flour, beat until just combined, and then add ½ cup of the milk, beating until just combined. Repeat with the remaining flour mixture and milk until combined. Bake in preheated oven for 30-33 minutes, until lightly golden and baked through. While cake is cooling, make the whipped cream. Place heavy whipping cream in a large bowl and beat with electric mixer until stiff peaks form. Fold in powdered sugar and vanilla. 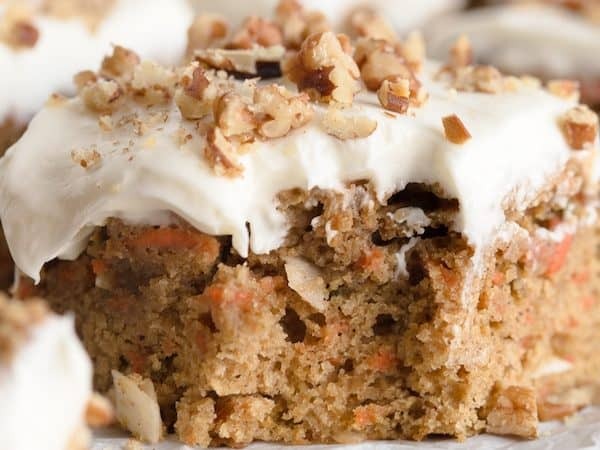 Once the cake is cool, remove the cake from the baking pan and place on a baking sheet. Slice cake in half so there is a top and a bottom. Carefully place the bottom layer back in the pan. 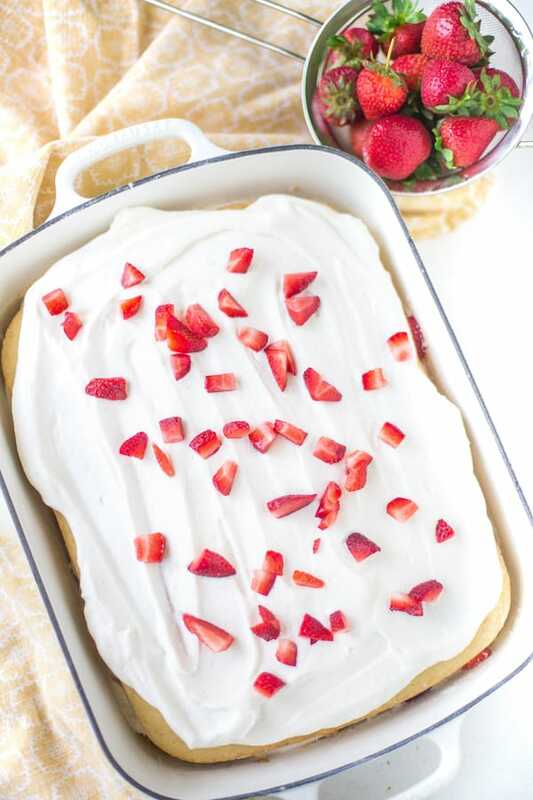 Spread 2 cups of the whipped topping on top of the bottom layer and sprinkle with ½ of the strawberries. Place top layer on top of strawberries and spread with remaining whipped topping and strawberries.